Alternator, Arc and Spark. The first Wireless Transmitters. "Anyone who has had actual contact with the making of the inventions that built the radio art knows that these inventions have been the product of experiment and work based on physical reasoning, rather than on the mathematicians' calculations and formulae. Precisely the opposite impression is obtained from many of our present day text books and publications." The origins of wireless, as it was then known, are to this day the subject of occasional dispute. Suffice to say that many independent scientists and engineers contributed something of significance as will be shown below, but it was the youthful Marconi who in the 1890s drew the threads together and, via his family's substantial business contacts and not inconsiderable wealth, plus his own indisputable talent for scientific investigation and improvisation, made a commercial success of it. It is also worthy of note that the company Marconi established one hundred years ago and which bears his name is still doing business today. However, it is beyond doubt that had Marconi not commercialised wireless when he did, then somebody else would have done so very quickly. The evidence for that is in the great rapidity with which Marconi found himself to have competitors in the new technology, many of them commercially successful, some of them embarrassingly so. For example, Germany's first antenna installation was erected by Professor Slaby and Count Arco on the tower of the "Heiland" Church in Sacrow in August 1897, their first successful transmitting experiments having covered half a kilometre in June of that year, only three months after Slaby had witnessed a series of demonstrations by Marconi on Salisbury Plain. This should be compared with Marconi's demonstrations on Salisbury Plain only one year previously, in September 1896, which covered 2.8km. The efforts of Slaby and Arco were later joined with those of Professor Ferdinand Braun and the firm of Siemens Brothers and Halske, from which union the giants AEG and Telefunken were born - two more commercial names still very much with us today. The essential elements of wireless were thus well known to many people and the technology for developing alternating current at radio frequencies (r.f.) widespread and generally well understood. Many a nation could boast its own expert, from the great Indian scientist Sir Jagadis Chandra Bose FRS who in the 1890s developed practical microwave and semiconductor technology, to the Canadian Fessenden, the Dane Poulsen, the Englishman Professor David Hughes who in 1879 failed to impress his learned friends in the Royal Society with his discovery and a multitude of others, including of course the Balkan genius of Tesla and the American dentist Mahlon Loomis whom many acknowledge to have carried out the first successful experiments many years before anyone else in the 1860s but without obtaining any publicity or financial backing. High frequency alternators. The main exponents of this, Ernst Alexanderson and Professor Goldschmidt, produced high speed rotating machinery to generate the desired power directly, exactly as Tesla had done for George Westinghouse's household low frequency a.c. distribution system in the USA years before. Indeed, the first successful r.f. alternator was made by Tesla himself in 1899 and operated at 30kc/s. Alexanderson was Swedish by birth but spent most of his life in America and produced his alternator for the Canadian Reginald Fessenden, who was once chief chemist and engineer for Thomas Edison. 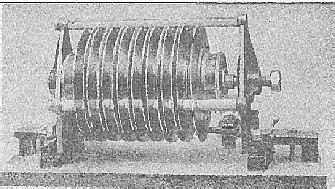 Fessenden himself was the inventor of many significant devices, one of which, the "roller coaster" variable inductor, is still in use today. It was with one of Alexanderson's alternators, suitably tweaked by Fessenden, that the first voice broadcast took place on Christmas Eve 1906. The technique was expensive to apply because of the high rotational speeds and high electrical losses at high frequencies, but nevertheless enjoyed considerable commercial success and gave rise to the first true continuous wave (sine wave) wireless transmissions of high spectral purity, though it had the great mechanical limitation of being restricted to comparitively low frequencies, up to 100kc/s. This could not compare with spark, which was used at over 1.5Mc/s, but the trend at the time was to longer and longer wavelengths and lower frequencies, where the alternator could compete exceptionally well. Indeed, one notable Marconi spark station in the USA was replaced by an alternator of Alexanderson's design. Efficiency was not impressive in the smaller versions, over 10 horsepower (7.5kW) input being required for 2kW output, there being great heating losses in the copper windings and iron armature and frictional losses in the gear trains used to achieve high rotational speeds of 20000rpm. In Germany a somewhat different strategy was developed based on frequency multiplication. 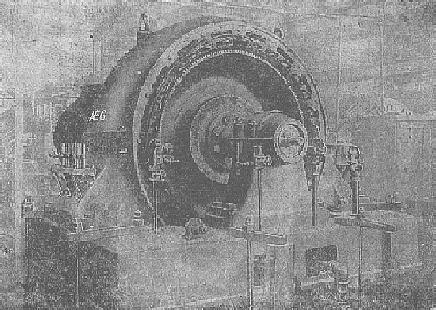 This was sometimes referred to as "the Arco system" and such an alternator, built by AEG, is shown in the photo (apologies for the quality - the original is of very poor contrast). Telefunken made some large machines, one water cooled of 400kW was installed at Nauen and opened for business with great festivities in 1920; it escaped the penalties associated with high rotational speeds, and high frequency copper and iron losses by using the frequency multiplication technique, which was based on saturable transformers having a dc winding, to produce a range of possible output frequencies based on the relatively low 6kc/s output from the generator. The rotor measured 1.65m in diameter and weighed seven tons, the output was 450 amps at 1200V. The output could be on-off keyed by spoiling the frequency multiplying action of the first of the chain of multiplying transformers by a resistance keyed in and out of one of its windings, which was a great advantage over the rival arc transmitters. The antenna current was typically 400 amps with a feedpoint voltage of 80kV or more and the transmitter was keyed mechanically at 80 words per minute (wpm); others of this period in the USA at New Brunswick and Annapolis could be keyed at 100wpm, and all without sparking at the contacts! A lot of development work was done on the frequency-multiplying transformers, since these extended the utility of the alternators, which could only generate the higher frequencies by using very high rotation rates and losing much power in iron and copper losses. These transformers were generally 90% efficient, but because of the high powers normally used were cooled in an oil bath, which also aided insulation at high frequencies, oil insulation being even more effective at high frequency than at low as Tesla had shown years before. 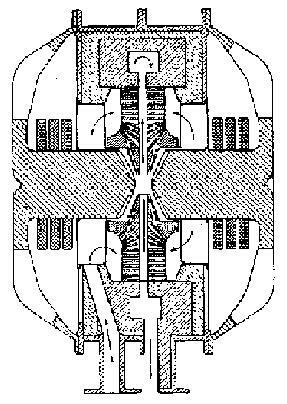 Latour developed a frequency-multiplying transformer which could be used for producing the third or fifth harmonic at will, and without needing a dc winding on the core. He used a special nickel steel alloy, which saturated at low magnetic field and which had low hysteresis - probably a forerunner of the more modern permalloys and the like. A transformer of his, for 12-15kW, used just 500 grams of nickel steel and lost only one kilowatt in heat. It was used for tripling 33kc/s to 100kc/s. The Nauen station building still exists and is still used for radio transmission, which must make it one of the oldest monuments to wireless which has been in continuous use for the purpose for which it was built, though the alternators it once housed have long gone. One large working example of these magnificent machines, built according to the Alexanderson method, remains at Grimeton in Sweden, and is run up ceremonially each year. Alexanderson has left us with another legacy in the form of the magnetic amplifier, a saturable reactor which is controlled by a dc winding. 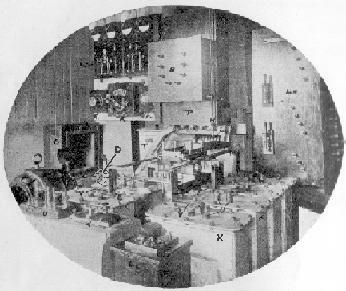 It was with this that Fessenden modulated the alternator output for his 1906 broadcast and magnetic amplifiers of many forms are still used for a wide variety of purposes today. The electric arc. In 1898 a Dr. Simon from Frankfurt had noticed that the electric arc could be made to sing by means of a modulating voltage on the arc supply. After a number of experiments he showed that the electric arc made a reasonable loudspeaker which he demonstrated in public auditoria. Also, the modulated arc produced not only sound but a modulated light beam by means of which the German Navy managed to make intership telephone calls using a modulated arc searchlight and a photosensitive selenium cell. In England, William Duddell, an electrical engineer responsible for inventing the moving coil oscillograph (an early device for the photographic recording and observation of oscillating audio frequency waveforms which was still in use in the 1940s) and the thermo-galvanometer (later used for measuring antenna currents and still used in slightly modified form today) discovered that by placing a series tuned circuit across the arc, audio frequencies could be produced by spontaneous oscillation without the need for a separate modulating supply, but that the efficiency plummeted as the frequency was increased. In 1899 Duddell demonstrated a musical instrument which was based on this discovery. The Danish inventor, Valdemar Poulsen, who had demonstrated the 'Telegraphone' (the world's first magnetic recording device) at the Paris exhibition of 1900, turned his inventive genius to the problem and by means of a water cooled copper anode and by making the discharge occur in an atmosphere of hydrogen or illuminating gas, succeeded in raising the efficiency and frequency to the desired level; Poulsen's arc could generate frequencies of up to 200kc/s or so and he patented it in 1903. The Poulsen system and its variants were enormously successful, much to Marconi's chagrin; the American Navy in particular seemed very keen on them. The use of a reducing atmosphere meant that glowing particles of metal oxides could not be formed, and it was these particles of incandescent metallic oxides, which at high temperature emitted thermionic electrons into the arc - a phenomenon explained in 1904 by Wehnelt and later exploited in the "dull emitter" cathodes of indirectly heated valves - which had extended the quenching time of the arc in air and limited the experiments of Duddell. Even hot metal particles could prove troublesome and to eliminate as far as possible the effect of electron-emitting particles, the arc of larger transmitters was placed in a strong magnetic field in order to sweep these out of the system and improve the quenching. Arc transmitters were widely used and scored some notable successes, the Belgian experimenter Robert Goldschmidt using one for voice broadcasts at Laeken and only closing down his station shortly before the invading troops of Kaiser Wilhelm arrived at the onset of war. The technology to build large arcs had already been created for the chemical industry in 1902 (the "Atmospheric Production Co." based at Niagara Falls) and subsequently brought to a high state of efficiency by two Norwegians, the physicist Prof. Kristian Birkeland and the engineer Dr. Samuel Eyde, in order to fix nitrogen as nitrogen oxides, which could then be dissolved in water to make nitric acid, nitrate fertilisers and explosives. Calculation indicates that around 8kWh was needed to produce one kilo of concentrated nitric acid, and thus these massive arcs could only be sited where there was an abundance of "white coal" - water power. It is no coincidence that Dr. Samuel Eyde went on to become the first president of the famous Norsk Hydro company, remembered by most in connection with the 'Heroes of Telemark' who sabotaged heavy water production in the Second World War. A diagram of a Birkeland and Eyde arc is shown to the left. The magnet poles (diagonally shaded) are horizontal to the left and right of the central arc chamber, and on each pole can be seen three separate magnet windings. The copper arc electrodes, which are hollow and drilled with many holes through which air (shown by the arrows) circulates, are above and below the magnet poles. Many arc transmitters were commissioned, few of which needed the prodigious power plants associated with the Birkeland and Eyde process. Most were of a few tens of kilowatts or less, but there were stations of 100kW or above at Lyons, Nantes, Paris (Eiffel Tower), Rome, Saloniki (the Thessalonica of the New Testament), San Francisco, Hawaii and at least eight more in the USA, Cairo, Horsea Island and Portsmouth, these last two in England where their presence must have made Marconi wince. The odd megawatt of power shifting its none-too-clean frequency footprint up and down the waveband by a few kc/s generated more than a fair amount of interference as may be expected. Surprisingly, this only became objectionable when receiver technology improved (the price of progress!) as the receivers originally used to detect spark transmissions were very sensitive to the jagged damped wave trains generated by spark, but were relatively deaf to the more nearly undamped sinusoidal emissions of the quenched arc. If you wanted to receive arc transmissions, you had to use a special receiver, such as Professor Pedersen's "tikker" or Fessenden's heterodyne receiver, and thus other spectrum users with sets sensitive only to spark transmissions weren't offended by the harmonic-rich output of an fsk-operated arc - but that changed when after the First World War everyone went over to the new electronic technology, the thermionic triode, which could not distinguish between alternator, arc and spark and was sensitive to the lot. In England, radio amateurs had their apparatus confiscated during the First World War, purportedly to prevent espionage, but also because the Post Office wanted to clamp down on 'interfering radio amateurs'. This did not unduly impress the radio hams, who by and large caused little trouble (though one indignantly refused to surrender his equipment and was sentenced to six months in jail by the unsympathetic authorities) and when the Post Office opened a large arc transmitter at Leafield near Oxford in 1920 operating on 12200m the interference caused by this official source received a somewhat critical response. To add insult to injury, the British Post Office now insisted that amateur transmitting licences should carry a hefty price tag as a deterrent, and after a somewhat heated exchange of words, radio hams got their apparatus and transmitting licences back at a more reasonable price. Given the low frequency fundamental, the harmonics from an arc transmitter would be spaced, in the case of the Leafield station, every 25kc/s or so on up the spectrum for hundreds of kc/s like teeth on a comb, each 'tooth' jumping a handful of kc/s from side to side as the transmitter was keyed. This pretty well knocks the present day radio ham's complaint of television timebase interference into a cocked hat, and a Paris conference in 1920 had decided that all such transmissions should be prohibited, though Leafield and Dr. de Groot's mercifully distant masterpiece seem to have lingered on for a while. Happily, fsk is still with us and is used, in far more spectrum-friendly guise, in a variety of narrow-band data modes. The great arc transmitters have all gone, and little other than their means of modulation remains of their contribution to the art of wireless. A one megawatt arc, intended for the U.S. Navy, but cancelled at the end of the First World War, made its way by a circuitous route to the University of California at Berkeley where its large magnet formed the basis of Dr. Lawrence's cyclotron in the 1930s. This cyclotron has been preserved at the Lawrence Radiation Laboratory as a memorial. Curiously, Dr. Simon's singing arc which started the ball rolling, made a brief and unspectacular reappearance in the 1950s. 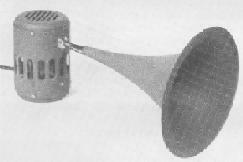 A Parisian inventor, Sigmund Klein, patented a new type of loudspeaker called the "Ionophone". It consisted of a radio frequency corona discharge inside a quartz tube which opened into an exponential horn. The radio frequency discharge was amplitude modulated by the incoming audio signal and this, coupled to the horn, produced extremely high quality sound reproduction at high frequencies. It was briefly manufactured in England and also in France, but was not a commercial success. The Ionophone is shown below. Spark, a.k.a. Damped Waves, alias 'Mode B'. The great spark stations, like the arc stations, have long closed down, but as in the case of arc and alternator stations have in a number of cases left behind buildings and antenna bases and guying blocks (see Peter Jensen's excellent 1994 book "In Marconi's Footsteps - Early Radio" ISBN 0 86417 607 4) although perhaps surprisingly they too have left vestiges of their technology behind them in strange places. The current high-tech amorphous alloys are made by a process which owes more than a passing debt of thanks to the first toothless rotary spark discharger used by Marconi at Poldhu in Cornwall in 1901, the high speed rotary cooling disk onto which the molten alloy is poured giving a cooling rate of more than a million degrees per second, so fast that the alloy doesn't have enough time to crystallise, and quite good enough for quenching a 300kW spark. The first commercial development of the Poldhu rotary discharger was a variant having teeth - the modification was so successful that the toothed from of rotary gap is now thought of as the norm, but the original had no protrusions from the disk. Unfortunately, the receivers of the day worked at long wavelengths and had to retrieve spark signals from amongst the crashing noises of natural static, the difference between them not being very great and the toothed discharger gave a characteristic rasping tone to the transmissions which aided the operator in picking out the signals from the emissions of mother nature. The toothless disk produced a more constant aerial current, but the sounds this created in the headphones were less easily distinguished from natural "interference". Marconi's first sales of the new discharger were to the British Royal Navy and in the photo the ten inch rotary disk, in the lower left, can dimly be seen, labelled D; at least three of the protruding studs are visible. The sound deadening cover is hinged open to allow the view. In the right foreground, labelled K, are four of the eight condensers. The zinc plate and glass condensers were immersed in oil and each was kept in a metal tank - hence the origin of the name "tank circuit" to describe the power output tuned circuit of a transmitter. This illustration is of the Marconi 5kW "Battleship" set and was installed on large warships of the Royal Navy in the First World War. Amazingly, this photo was published during that conflict. Just how likely would it be today for a major power to allow the publication of a photo of one of its naval communications centres during wartime? "have a theoretical and practical knowledge of the operation, adjustment, and maintenance of Spark, C.W., I.C.W., R.T. and D.F. Installations, . . ."
"Define the terms 'wavelength', 'amplitude', 'decrement', and 'damping'. Find the resonant frequency of a circuit consisting of a coil of 500 microhenries inductance in series with a capacitor of 2,000 picofarads." This examination question from barely fifty years ago seems a pretty good starting point for a discussion on how to optimise the output of a spark transmitter for the purpose of coupling it to a Tesla coil.